The market is back to even on the day. But, it’s still not clear whether the advance over the past hour is a completion of the a-b-c or the first subwave of the next wave down. 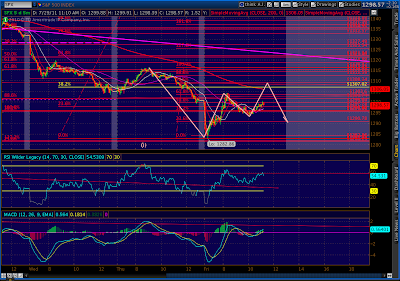 It’s also completed three of the four legs needed for a bearish Gartley pattern that started yesterday morning. 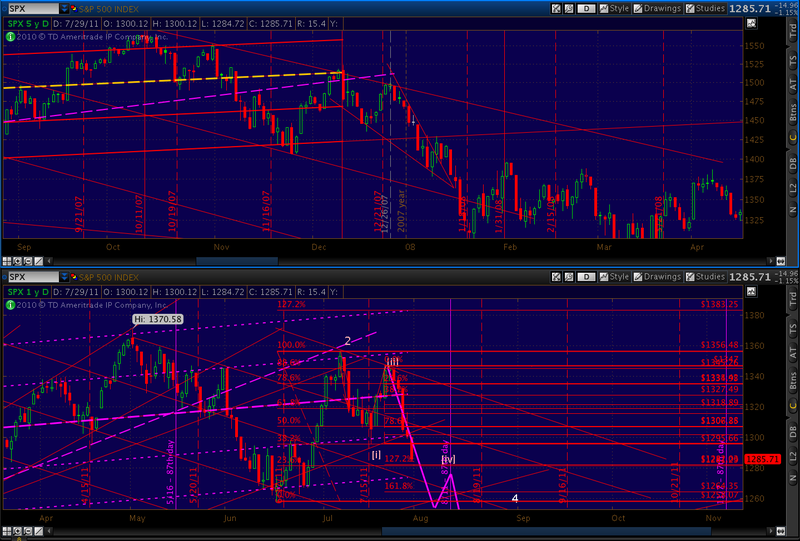 The D point (.786 Fib level) would be 1309.24, making 1307 – 1309 a reasonable limit to the upside. 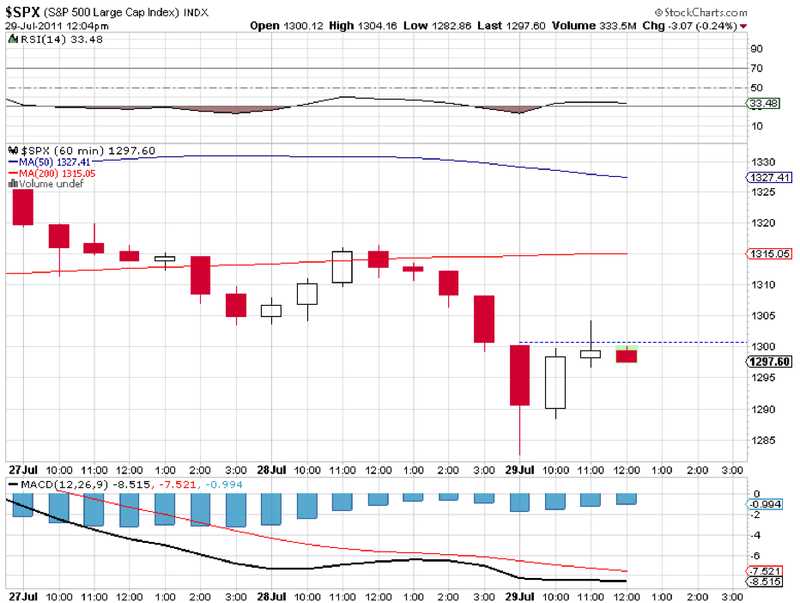 Just for the record, it’s worth noting that the MACD on the daily SPX is just now about to turn negative. 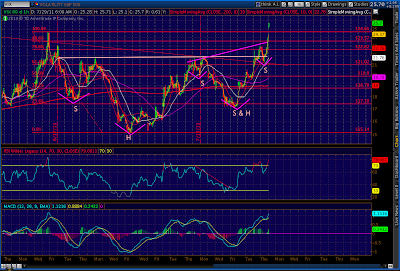 The RSI is still 42.5. While this short-term bounce is unsettling to bears, there’s plenty of downside left before one could consider the market oversold. 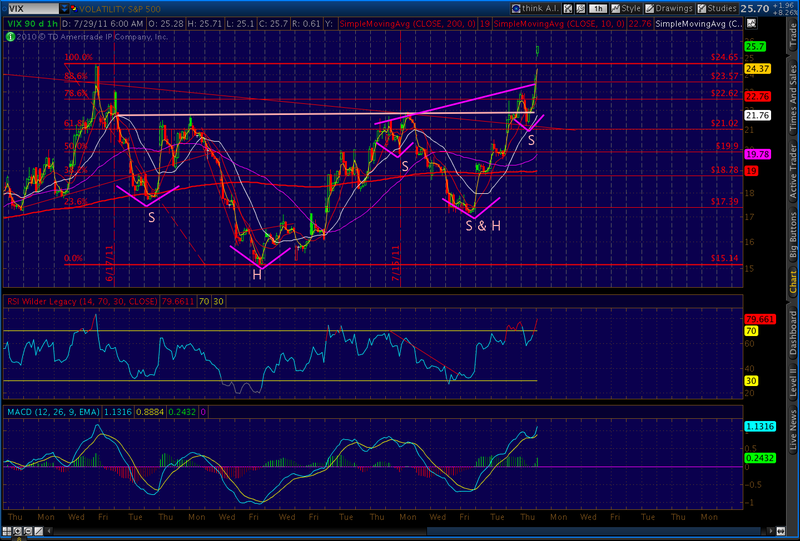 Note the RSI trend line on the 60 minute chart. It has yet to break through to the upside. 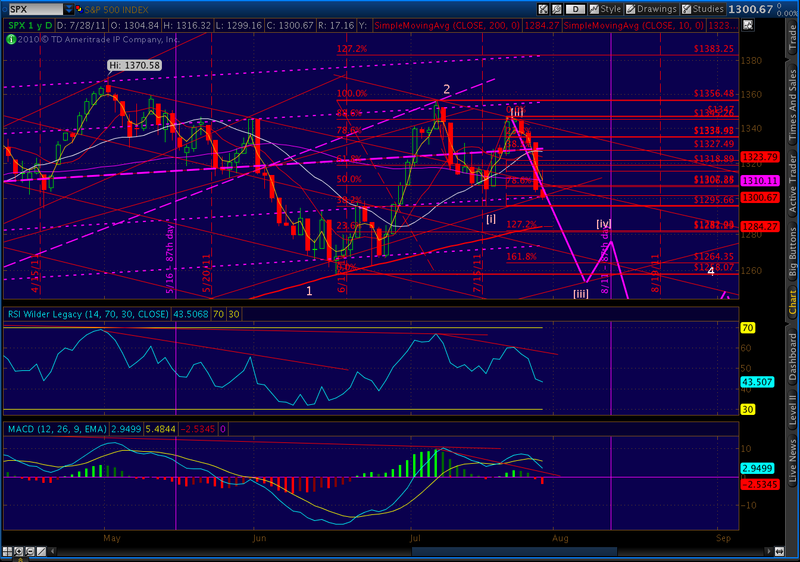 It’s likely this is all the correction we’ll get and that 1307 will hold. The same thing happened intra-day on Jan 4, 2007. 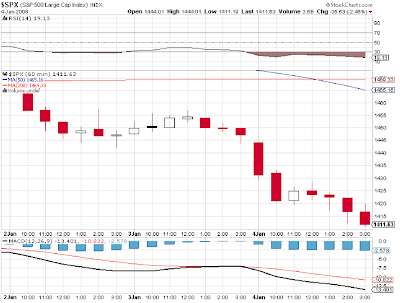 The market was off 25 points early, then bounced back in the third hour of trading, up 10 (a .382 retrace) before closing down 33 on the day. If we continue up, then this morning’s low was perhaps (i) of [iii] and the rally since then is the “a” in the a-b-c corrective wave. 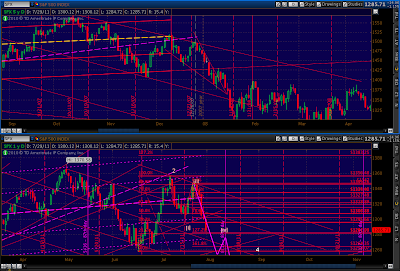 If so, prices could move up to the .50 Fib level at 1314.48. Remember Jun 27 – Jul 7, when everyone was amazed how the market put on 76 points in just 10 trading days? Some called it one of the fastest advances ever (it wasn’t), suggesting it was a clear sign of a new high to come. At this morning’s low, we’ve fallen 64 points in just 5 trading days. That’s almost 12.8 points per day, versus the 7.6 points per day for the advance. Suppose Reid’s plan passes. That’s a partisan Senate plan, nothing more. Are the House Republican’s any more likely to vote for Reid’s plan than Boehner’s? This is still going down to the wire, with a messy compromise whose sole purpose is to save jobs — namely, your Congressman’s. It will not reduce our debt burden, nor save our AAA credit rating, nor stimulate a moribund economy. 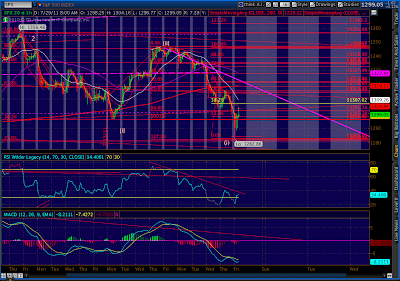 Whatever relief rally we get will be short and sweet and will be followed by a plunge to below 1200. 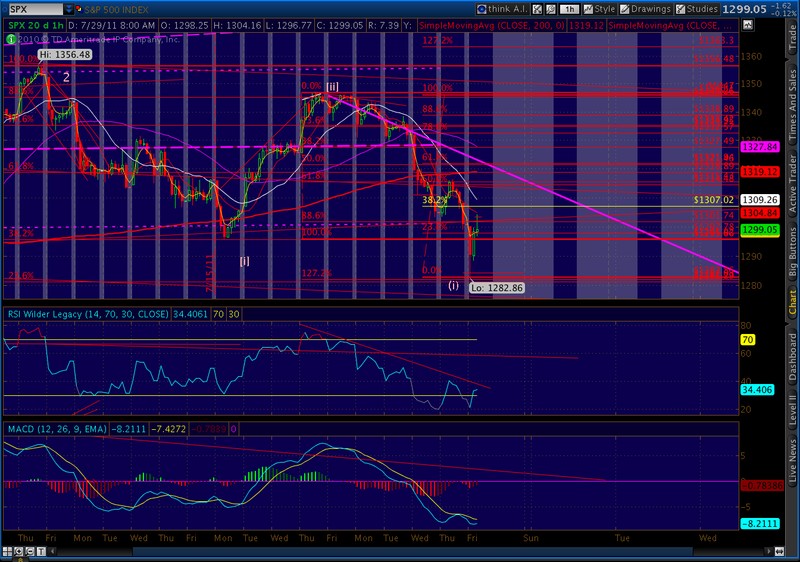 For anyone who’s curious, here’s the hourly SPX chart from January 4, 2008. BTW, I’m switching to Eastern time zone, just to make it easier on everyone. I know it’s enough hassle for folks around the world to convert to NY time without having to subtract an additional 3 hours for the left coast. I’ll probably screw up a few times, so bear with me while I get used to making the adjustment. I’m looking for a repeat of Wednesday, only worse. Looks like we’ll reach the 200 day moving average (1284.27) without too much trouble, with upcoming targets of 1273.54 (-2 std dev line of our regresion channel) and horizontal support at 1268.21. Up about 50%, thanks. I guess I need to post some more about BAC; it's been making some interesting moves this week. Hopefully get to it this weekend. How's those BAC puts doing, Pebble? The debt deal has highjacked the timeline, much like OPEX normally would. But, from what I've seen, I don't think the resolutions being discussed will leave us an better off. From above: "It will not reduce our debt burden, save our AAA credit rating, nor stimulate a moribund economy. 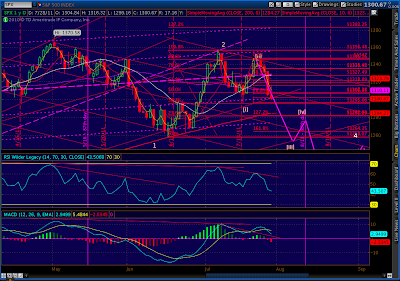 Whatever relief rally we get will be short and sweet and will be followed by a plunge to below 1200." I imagine something will be announced over the weekend or Monday, and the market will bounce — but only a little. Day traders might make some money on it, but for swing traders the trend is down. 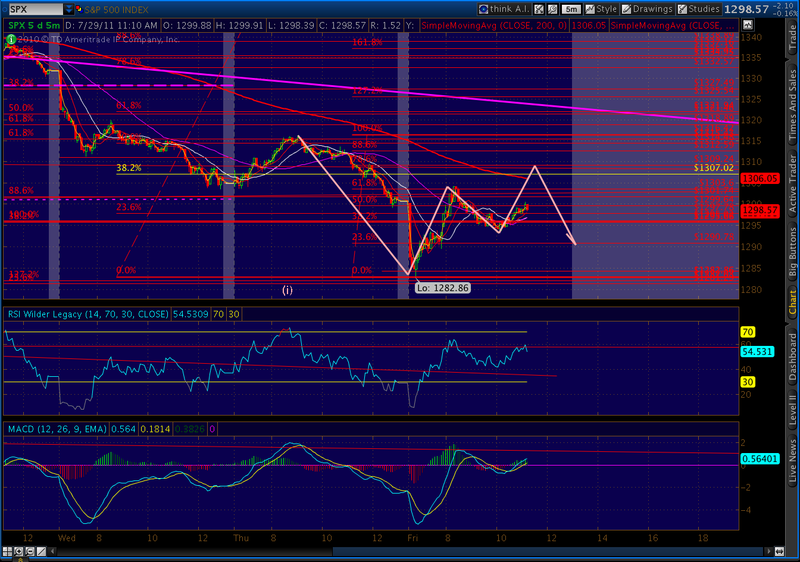 OK. 1307 or 1314, does not seem today is likely. We can get another debt ceiling bounce Monday if we get there. Not even sure if we will get it given the deep division. Do you have a time forecast other than price level? Hey George, just updated a few minutes ago with my thoughts on the bounce potential. This bounce is quite strong. Any target in mind? 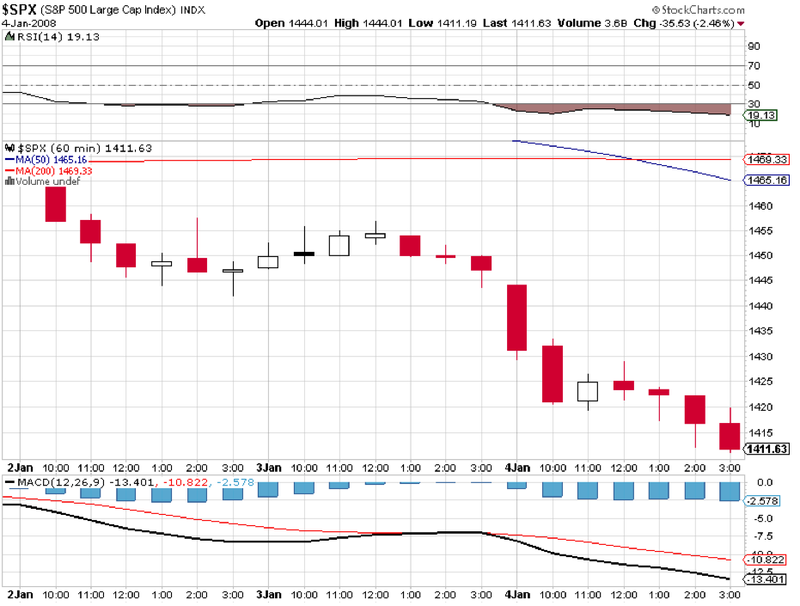 Seems the air is filled with QE3 talk.